Looking for dental crowns? Call us today to schedule your appointment! Dental crowns are tooth-shaped restorations that cover the entire visible portion of the tooth to restore its strength, size and appearance. 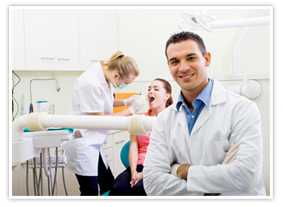 Our expert in dental crowns in Los Angeles may recommend a dental crown if you have a tooth that has been weakened by decay or damage, if you have undergone root canal therapy, if your tooth is severely worn, if you have an extremely large filing, if you have a dental bridge or if you have a dental implant. Dental crowns may be used on both children and adults. Preparing for the placement of a dental crown will usually require just two visits unless a root canal treatment is necessary. At your first visit, our Los Angeles dental crowns expert will examine your tooth. X-rays may be taken to check the tooth, the roots and the bone surrounding the tooth. The area will be anesthetized, and the tooth will be shaped to make room for the dental crown. Our expert in dental crowns in Los Angeles may recommend a metal crown, a porcelain-fused-to-metal crown or a porcelain crown, and the amount of dental enamel removed can vary based on the type of crown being placed. A filling material may then be placed to support the tooth and the crown. Once the tooth has been prepared, a dental impression will be made so that the dental laboratory can craft the new dental crown. A temporary crown will be placed to protect your tooth while you wait for your permanent dental crown. When the crown is completed, you will return for your second appointment to have it permanently bonded to your tooth. Our dentist will check your bite to ensure a proper fit and may make adjustments before bonding it. Special dental cement will be applied to your tooth, and the dental crown will be cemented into place. Dental crowns do not decay, but the teeth below them can, which is why it is important to continue to maintain good dental hygiene. Brush twice daily, floss every day and visit our dentist every six months. Contact our Los Angeles dental crowns expert to schedule your consultation. Copyright © 2013. DentalCrownsLosAngeles.com All Rights Reserved.